Having in vain tried to find any information about the origin of these two oratorio recordings I can only report that the Brilliant issue is licensed from Vox and that there are some LP sets still available on the secondhand market. The recordings are analogue and thus presumably from the 1970s. Wolfgang Gönnenwein was artistic director from 1972 until 2004. The sonics are not exceptional in any way but I detected some high-frequency metallic sounds, reminiscent of a triangle, here and there in Die Jahreszeiten but not in Die Schöpfung. The choral singing is excellent, and in particular the more dramatic choruses have a forward thrust that makes the music come alive. Ach, das Ungewitter naht! (CD 1 tr. 17) near the end of Der Sommer, is a true thriller. In Der Herbst the trio with chorus So lohnet die Natur (CD 2 tr. 2) is another high-spot. The same goes for the scene beginning with Simon’s swinging aria Seht auf die breiten Wiesen hin! and to the very end (CD 2 tr. 6-10) with the chorus for peasants and hunters and the concluding drinking chorus. 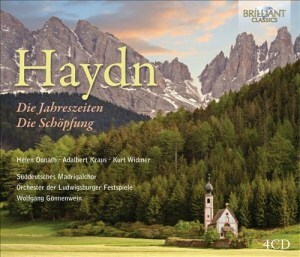 This is Haydn at his very best. Otherwise Die Jahreszeiten is more idyllic than dramatic. It was a good idea to place Die Schöpfung last, with its more extrovert dramatic power. Also there the choruses are the core of the performance with a riveting reading of Vollendet ist das grosse Werk (CD 4 tr. 7). Gönnenwein’s readings are rather middle-of-the-road. Comparing his Schöpfung with two of my other recordings he is neither pompous like James Levine (DG) nor springy and airy like Andreas Spering (Naxos) with period instruments. This has been my preferred recording since I reviewed it more than seven years ago. By his side Gönnenwein sounds ordinary and a little uninspired. His soloists are also a bit pale. Levine has Kathleen Battle, Gösta Winbergh and Kurt Moll in tremendous form; Spering has Sunhae Im, Jan Kobow and Hanno Müller-Brachmann, all three wonderfully alert and youthful. Helen Donath has been a favourite since I bought Solti’s Rosenkavalier back in 1969, where she is a lovely Sophie.Her voice is in good shape here too but occasionally she is a bit fluttery and rather monochrome. She is best in Die Schöpfung where Nun beut die Flur das frische Grün (CD 3 tr. 8) offers the best solo singing on the whole set, together with Auf starkem Fittiche (CD 3 tr. 13). Adalbert Kraus is a small-scale tenor, rather sensitive in recitatives but he is nowhere as elegant and beautiful of tone as Winbergh and Kobow. Concerning Kurt Widmer I am in two minds. His voice, more baritone than bass, is not very beautiful, he lacks the lowest notes that Kurt Moll in particular has almost in the extreme and he sometimes struggles and adopts a vibrato that is unattractive. But - and this is an important but - he is expressive and he delivers the text with the utmost clarity and understanding. He makes you listen. Sometimes he can be over-explicit. Im Anfange schuf Gott Himmel und Erde at the beginning of Die Schöpfung he is so extremely slow that one gets the feeling that he will never come to the end of the recitative. That said, he certainly makes you listen. I don’t think I will take down this box from the shelf very often especially when I instead can be impressed by the breadth and magnificence of Levine. It also compares unfavourably with Spering’s historically informed and vital reading of Die Schöpfung or Morten Schuldt-Jensen’s Die Jahreszeiten, also on Naxos. Someone wanting to buy his/her first recording of the two oratorios could feel satisfied with Gönnenwein, considering Brilliant Classics’ budget price, but the ones mentioned above are to be preferred by far.